President Barack Obama announced today that he is sending as many as 300 military advisors to Iraq and positioning naval forces nearby that, if necessary, will be able to carry out “targeted and precise” strikes. Obama said several times that his administration’s goal is to create an “inclusive” government in Baghdad and bring “stability” to the Middle East. I doubt he will be able to accomplish either of these objectives. ISIL’s main adversaries in the Sunni areas could turn out to be the Sunnis themselves, who, chafing under the Islamist fanaticism of Al Qaeda in Iraq—ISIL’s predecessor—ousted it from power. 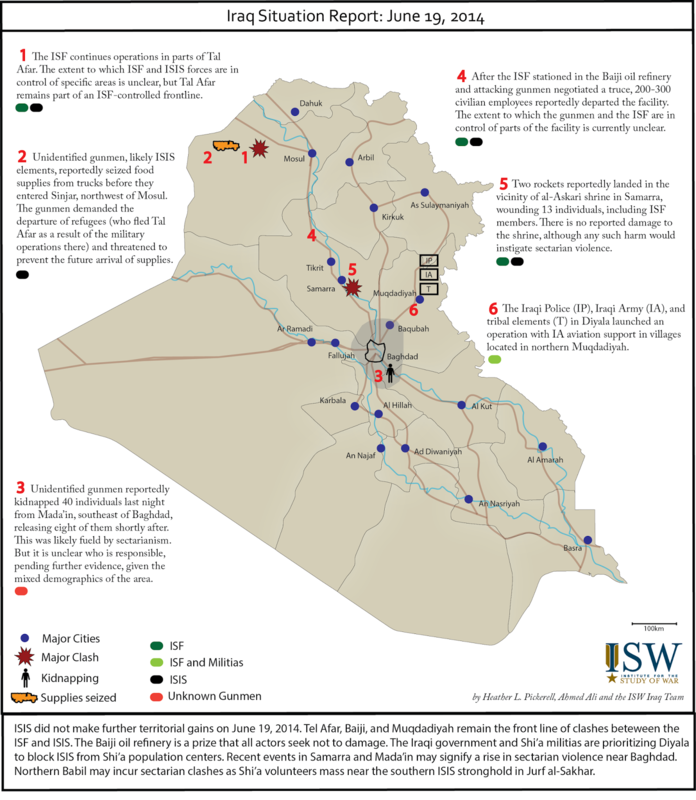 But for the time being, ISIL enjoys the support of the Baathists, and if they can maintain their hold, the most likely outcome in Iraq will be the country’s breakup into Kurdish, Sunni, and Shiite regions. That will complement the breakup of Syria into Alawite (Shiite) and Sunni regions and the destruction—which is an ISIL goal—of the territorial boundaries that the British and French tried to erect after World War I when they created Iraq, Jordan, Syria, Lebanon, and Palestine. If the United States' strategy is to prevent this breakup from occurring, it will have to intervene far more forcefully than Obama announced—and even then, it is highly unlikely that the administration will succeed. Once the genie of ethno-religious nationalism is out of the bottle, it is very hard to put it back again without massive repression and killing. In Washington right now, one hears two kinds of strategies discussed. One strategy, put forth primarily by people who championed the invasion of Iraq in 2003, is to intervene forcefully from the air on the side of the central government in Baghdad and to provide extensive military support, even possibly launching a no-fly zone, to aid the opposition to Bashar al Assad in Syria. This strategy might make sense if the two wars were unconnected and had not degenerated into religious conflicts. As it stands, however, the strategy would seem to put us on different sides in two ethno-religious civil wars—with the Sunnis in Syria and the Shiites in Iraq. In addition, I don’t think the American people or Congress would support it, or that Obama would do it. The second strategy would consist of seeking stability and an end to the two civil wars by accepting some form of partitioning of both countries—or at best a strict federalism with a weak central administration. It would also include—although no one is willing to say this aloud—the perpetuation in government of some unsavory people, including Assad or his close supporters. That kind of strategy would necessarily have to involve close cooperation between the United States and Iran, which is the main power behind Baghdad and Damascus. It would involve extensive diplomacy and linkage with the Iranian nuclear talks—the kind of amoral underhanded dealing for which Henry Kissinger became famous, but which the Obama administration has avoided. Obama and Secretary of State John Kerry have resisted any semblance of this strategy in the past—they even refused to allow Iran to participate in the last Geneva talks on Syria—but they are now talking to Iran about Iraq. There is enormous political pressure in Washington from neo-conservatives and backers of Israel’s Netanyahu government not to cooperate with Iran. This week, the Washington Post editorial page featured an op-ed by Max Boot, a prime supporter of the invasion of Iraq in 2003, and Michael Doran, a member of George W. Bush’s Security Council, comparing cooperation between the United States and Iran to cooperation between Neville Chamberlain’s Britain and Hitler’s Germany. I recall hearing this comparison before. Obama is in a difficult position. He is suffering from political cross pressures. On the one hand, there is next to zero public support for any military intervention in Iraq or anywhere else. In an April NBC/Wall Street Journal poll, 47 percent thought the United States should become “less active” in world affairs; only 19 percent thought it should become “more active.” At the same time, when the press reports chaos overseas, and when the President’s opponents in Washington accuse him of being weak for not ending the chaos, public support for the president plummets. In this month’s NBC/Wall Street Journal poll, only 37 percent of the public approved and 57 percent disapproved of the President’s handling of foreign policy. That’s an all time low for Obama. Charges of weakness from McCain or The Weekly Standard are often reinforced by hyped reporting meant to keep viewers from switching channels. Waiting for Obama to speak today, I heard Christiane Anampour saying on CNN that ISIL represented a “dire and existential threat” to the United States. Then CNN’s Jake Tapper said ISIL “is advancing closer to Baghdad.” I don’t think either of these statements were true—on Thursday, the Institute for the Study of War’s daily report said, "ISIS did not make further territorial gains"—but I think the reporters were merely trying to create drama around the President’s speech. They weren’t trying to pressure him for action, but statements like these have exactly that effect and probably led to the president advancing measures today that make it look like he is doing something to hold Iraq together, but that are unlikely, on their own, to succeed. Correction: The article originally quoted Jake Tapper as saying ISIL "is approaching closer to Baghdad" when he said ISIL "is advancing closer to Baghdad."